So it happened. I don’t know how it happened (I mean, I know how it happened!) but it most certainly wasn’t planned to be this way, not now at least! After way too many days having gone by where expected events hadn’t happened, but still completely confident that the timing may just have shifted, I humoured my husband and peed on a stick. There was a flood of tears. And admittedly, these tears were not those of joy, you know the kind you see in movies because the characters are overwhelmed with happiness that they are going to bring this adorable, little, innocent, absolutely cute and all their very own mini human into this world. I, on the other hand, had an ugly cry. The kind where you can’t catch your breath, everything is leaking and you see blurry because your eyes have become a faucet from which all your hopes and dreams are pouring out of you. My husband ran upstairs to see what was the matter and there I was bawling my eyes out. When he realized what was happening, he began bawling because his dreams were coming true and I was bawling because I felt as though my dreams had all just shattered, in that very moment, all over the bathroom floor. The dichotomy between our responses is real. It’s representative of the very real double standard that still exists in our society today. Both my husband and I are extremely driven, ambitious and hard working professionals. But I was under no illusion, career-wise, the impact of having a child would be more burdensome on me than it would be on him. The mommy-track terrifies me. It may not be spoken out loud or acknowledged (ever, by anyone, because that would look bad) but subconsciously, and maybe even consciously, the bias is there. The bias is real. And it is unfair. It pushes so many willing, capable, credible, successful women onto a moving sidewalk of sorts, making it very difficult to merge their way back onto the zooming superhighway they were previously on. But I wasn’t going to let myself be defeated that easily, not this early on in the game. With the reality of my new reality setting in, my mind was in overdrive and I could feel the rush of all my fears surfacing at once. My life was about to change in a way that I couldn’t anticipate or understand at this point. But I had so many questions that I needed to answer; so many important decisions I would have to make. In Canada, we have a 1-year parental leave. This means that parents-to-be have the option of taking up to one year off in the first year of their child’s life. With this in mind, what was I going to do? If I didn’t take it, would I regret it? If I did take it, would I regret it? Do I need to take it? Should I take the entire year or only a few months? Should I split the time with my husband? What was the impact of this going to be on my career? For the first few weeks, I kept the news to myself. I was in the process of working toward a promotion and was concerned that by telling people, it would hurt my chances of getting it. Who would promote a pregnant woman that was going to take leave soon?! I began to wonder if I would promote a pregnant woman if I was in a position to do so? The fact that I even stopped to ask myself that question frightened me. It frightened me because it validated the fact that while the gap in equality between the genders is closing, there is still much work to be done to get to a place where taking leave for the care of a child is a normal as it is to take vacation. What does going on leave have to do with an employees performance anyway. What would my return look like? How could I ensure that when I do come back, that I will not be put in a completely different job, one that I don’t like and that requires me to start all the way from the bottom again? Because that would be hard to take after all my years of hard work. All the work I would have put in up until now would be meaningless. I kept thinking that this is such bad timing. This couldn’t be happening at a worse time. There was no way to maintain my career inertia. I’m never going to be as successful as I hoped and planned to be. Maybe I should just lower my expectations and define a new, less amazing reality that is more realistic for myself. Maybe I was never meant to achieve greatness?! In the few weeks that followed my discovery that I was pregnant, I kept the news to myself and hustled at work like nothing had changed. I pushed through the nausea, ginger ale in hand, and kept working hard for my well-earned promotion. I worked harder and longer, knowing full well that nothing came free. I had to put in the effort, not matter the circumstances. If I was going to plan on taking any parental leave, I surely wasn’t leaving without my promotion in hand. Promoted?! You sure?! I had to ask twice just to make sure that this was really happening. I did it! Pregnant, nauseous, bloated and all. It was the happiest moment in my career in a long while. I felt a combined sense of accomplishment and freedom that I had hoped for. Well, except for that feeling of guilt that I had yet to break the news of my pregnancy to them. I mean, it wasn’t going to be much longer before I would no longer be able to keep my blazer jacket buttoned and would have to resort to pants with a hideous (yet amazingly comfortable) elastic tube to hold them securely against my expanding body. In the days that followed my promotion, I knew that I had a responsibility to advise my Director of the situation. It was only fair. Transition planning was going to need to take place, a replacement identified and a download and transfer of my knowledge, responsibilities and key resources completed. But I was, admittedly, terrified. Could they take my promotion back? Would it reflect badly on me that I waited 3 months before advising anyone of my pregnancy? The sweat was real. I took off my blazer and walked into my Director’s office. I closed her door and before I could get a word out, I started crying. My feelings of guilt, worry and fear took over me. Guilt for the fact that I would have to take some form of leave from work and therefore not be able to continue my much enjoyed role on the high visibility and aggressive project I was working on. Worry that I would let my Director and team members down. Fear that everything I had worked so hard for up until now would all be in vain because I was going to be mommy-tracked. She was incredulous. As well as completely understanding and compassionate. How lucky was I?! Our conversation moved from “Oh my God, I can’t believe you’re pregnant!” to “How am I going to manage this and my career?”. What do you want to see happen? If you want to be mommy-tracked, you can totally have that happen to you. If you want to continue being ambitious, hard-working and successful, you can do that too. You choose. And she is absolutely right. Just like I work with so many of my clients on achieving their goals, this was simply a question of defining and laying out my plan for a successful and productive maternity leave that would position me for a successful return to work. The only person that has any control over the outcome of all this is me, no one else. On that note, I left her office on a mission – as I usually do! – to lay out a plan to defy stereotypes and baby proof a career I have worked hard to build. 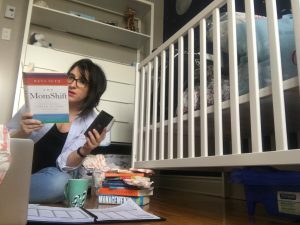 In A BUMP IN THE ROAD PART II, I’ll share with you how to strategically plan your transition from work to parental leave in order to baby proof your career and ensure a successful return all while maintaining a sense of confidence, action and intent so not to lose the career momentum you’ve built up! ANGELA IS AN ENGINEER WITH 10 YEARS OF OPERATIONS AND PROCUREMENT EXPERIENCE WHO IS ALSO A CERTIFIED PROFESSIONAL COACH. SHE IS THE CREATOR OF THE PROFESSIONAL CAREERIST, A BLOG FOCUSED ON HELPING PEOPLE ACHIEVE CAREER SUCCESS WITH A DASH OF EDITORIAL SASS ON TOPICS AROUND PERSONAL AND PROFESSIONAL DEVELOPMENT. FEEL FREE TO GET IN TOUCH! In the comments section below, share the fears you experienced when you discovered you were pregnant. Were you worried about your job/career? What do you wish you would have known then that you know now and would like to share with others?